Both Australian trade minister Craig Emerson and treasurer Wayne Swan over the weekend entered the debate over whether the country is facing a period of decline as the country's resource-led economy loses steam. The current debate was sparked by comments from two of Australia's foremost economists, Bob Gregory and Ross Garnaut who said this week the end of the mining boom would "feel like a bust" and that consumers face a "deflationary shock" with a fall in real incomes of 6% – 7% of GDP. In an economic note released on Sunday, Swan said: "It's disappointing that there are those in our community that continue to talk down our nation's prospects," adding that Australia is one of only seven nations that enjoys a AAA sovereign debt rating from the three major ratings agencies. Emerson chimed in with similar criticism saying that the comments from the economists were way off the mark, but added that Australia "can’t just be reliant purely or primarily on minerals and energy" to maintain living standards. Cutbacks in spending and possible tax increases would be necessary to return the state budget to a surplus and give the central bank room to cut rates, Emerson said. Australia has managed to avoid recession for 21 years as China’s infrastructure-led economic stimulus fueled demand for commodities such as iron ore and coal, driving the country’s trade balance to a 40-year high in 2010. Australia now has one of the developed world’s lowest debt burdens, at just 27 percent of gross domestic product compared with 68 percent in the U.S. and 212 percent in Japan. In August a similar flurry of comments emerged in the media after the impromptu declaration of an end to the Australian mining boom by the country's resources minister Martin Ferguson. 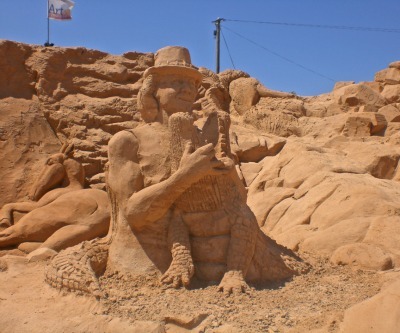 Image is of an exhibition of sand sculptures, Crocodile of Dundee, on June 28, 2008 in Algarve, Portugal.